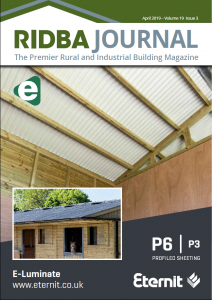 The RIDBA Journal is the only magazine dedicated to the UK agricultural and industrial buildings industry, and is free to download! It is packed with industry relevant news, views, guidance, and information on a range of subjects which affect you and your business. The RIDBA Journal calls on expertise and advice from the leading players in the market, plus RIDBA's partners and contacts. The Journal is published by RIDBA and is produced four times a year. It is distributed to over 1,200 companies within the rural and industrial buildings sector. The RIDBA Journal is sent in the post to all members of RIDBA as part of membership. If you would like more information about subscribing to the RIDBA Journal, please email marketing@ridba.org.uk. If you are looking to make your brand more visible and reach your target audience, look no further than the RIDBA Journal! For a full list of advertising opportunities download the media sheet. Reach a large audience of loyal readers to promote your business - the Journal is sent to over 1,200 companies reaching key decision makers in farming and construction, including, frame manufacturer members, designers, land agents, colleges and consultants. Supporting your industry - support RIDBA and encourage other contacts and members to advertise in the RIDBA Journal as this will not only raise the profile of RIDBA but add value to your company.